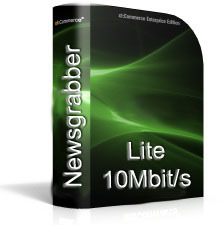 The ideal package for the Usenet Professional who is starting using the usenet just now or for the user that has a slow internet connection. With this package you have access to our our servers with a maximum speed of 10Mbit/s. During the time of your subscription you can use our system 24/7 with a unlimited amount of datausage (according to AUP). Important: After your payment always return to the website to log in to be shure that your order is finished and activated correctly!